Whelp, I don’t know if you’ve noticed the price comparison between a raw bird to take home and roast, versus a scrumptious rotisserie chicken from the market. A long time ago, I decided that I would save my amazing crispy roast chicken for special occasions, and just let the grocery store do my weekly chore…cuz the price difference is almost obsolete…and my time is EXPENSIVE (or at least I think so 🙂 ). So, yay, one meal down…rotisserie and crusty french bread accompanied by veggie dishes. 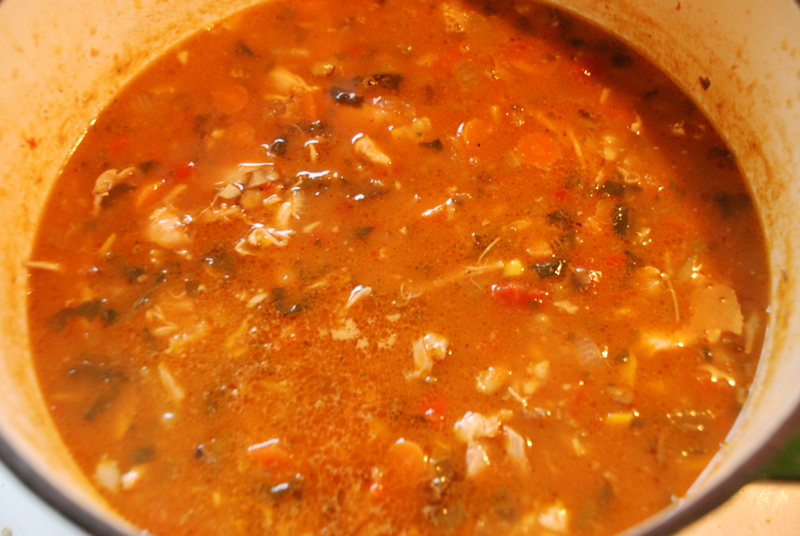 Now, what to do with the leftovers…..
Chicken Tortilla Soup!!! 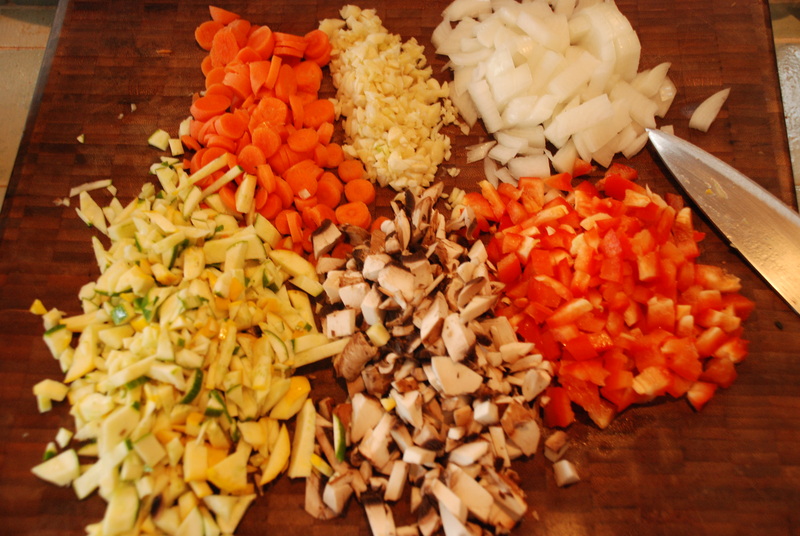 The path to an amazing soup is an easy one….basically I hit the fridge to see what veggies are lurking in there and then I chop. Here I used red bell pepper, baby bella mushrooms, a zucchini (from our neighborhood farmer a week ago…and it was definitely needing to be eaten, it was starting to look a bit sad), an onion, carrots and garlic (of course). Really a delicious medley! Now time for some frozen veggies. 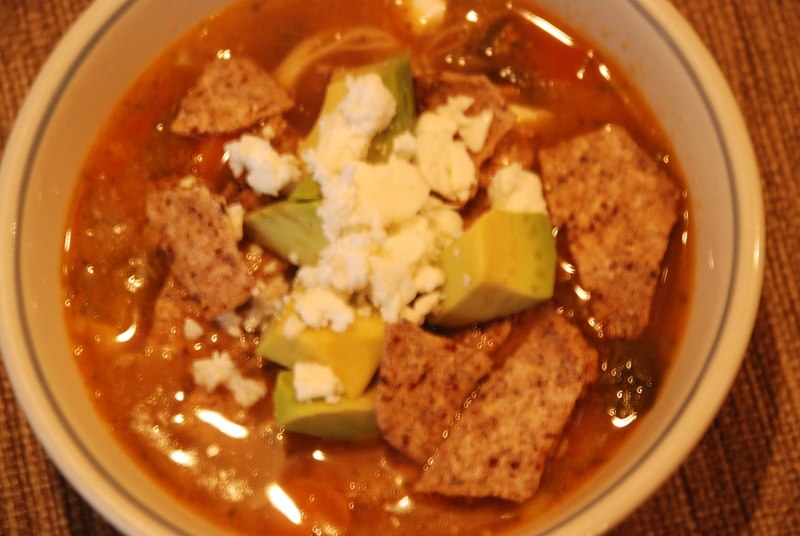 I almost always keep my freezer stocked with sweet corn and spinach….both were an awesome addition to my tortilla soup. Ok, I am a major color girl…even in my cooking. But, isn’t this looking divine? Time for for the left over rotisserie chicken and the broth. I used a an entire box of broth here, and then topped off with water…trust me, the intense flavor of this soup can stand up to a bit o’ water. Oh, and the bird is upside down…the high sheen is the flavorful juices mixed with the natural gelatin from the bird…it’s flavor packed despite looking a bit yuck. On with the seasoning…I think lemon and it’s zest are one of the most important flavor components to a good Latin soup…a little trick I picked up from an El Salvadorean friend. 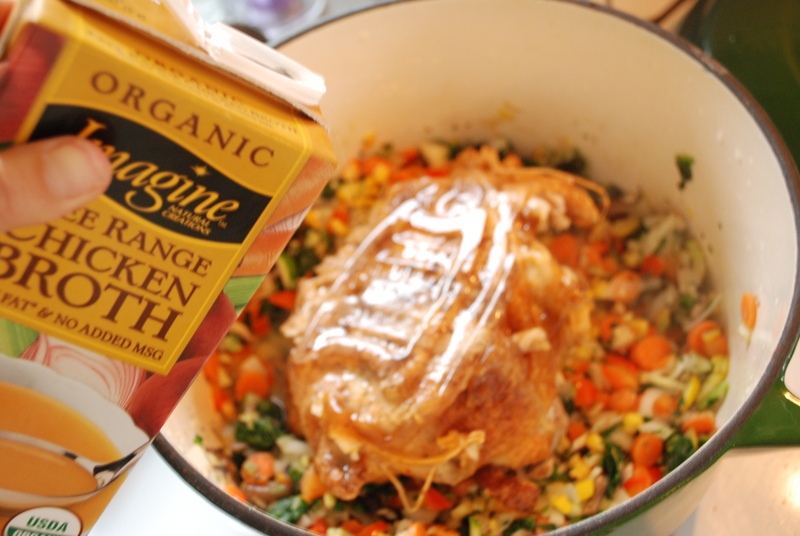 Trust me, even if you don’t try my recipe…punch your own up with this addition. Spice wise, I dropped in a tablespoon of paprika and a tablespoon of cumin…two must-haves. Oh, and don’t forget the tomato flavor layer! You could use fresh tomatoes, but I had some jarred crushed tomatoes to throw in. One regular can would work great! Ok, I am sparing you the pix of my picking. Basically, grab a pair of tongs and start pulling out the bones..I usually make a quick job of it by having a large plate at the ready. That way, I can pull big pieces of chicken out and work on separating the meat without getting a steam facial over the soup pot. This step doesn’t take long because the meat basically falls off the bone (tee hee, but Sean always manages to get a small bone in his soup bowl…go figure). Last flavor step should be done right before serving…cilantro. 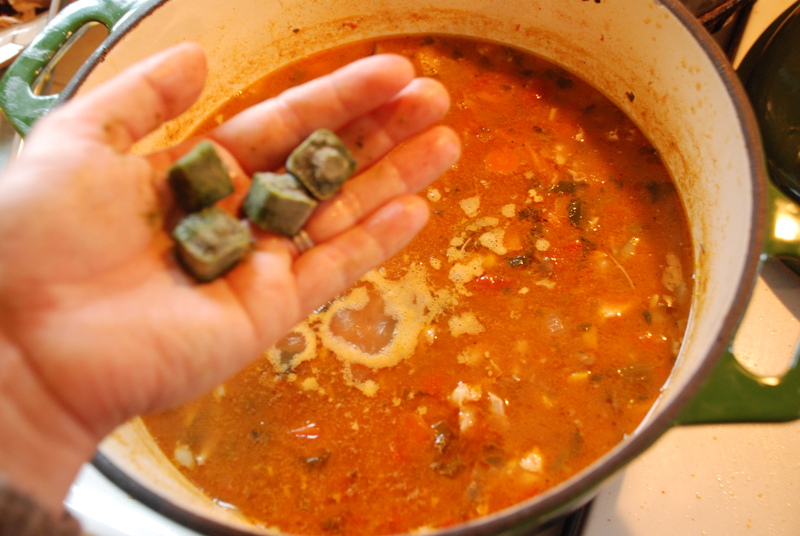 I used frozen cilantro cubes because that is what I had on hand, but go ahead and give a bunch of fresh cilantro a chop and dump it in. 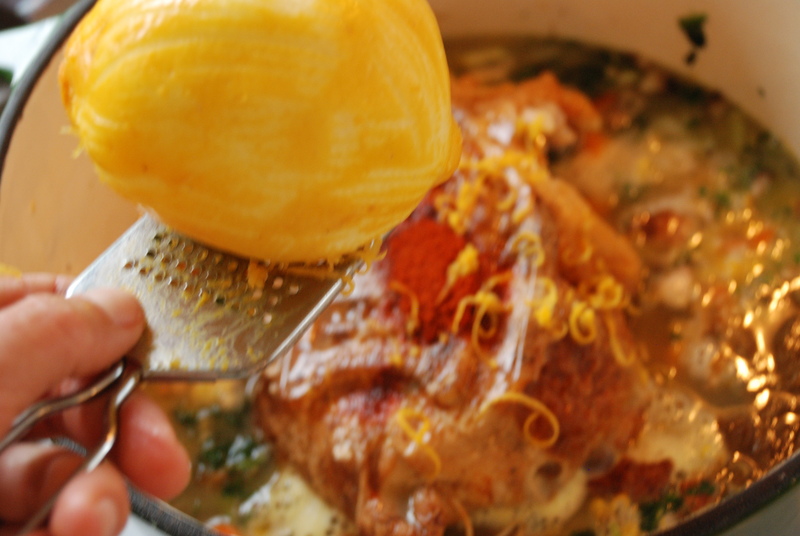 The final product is ridiculously good…don’t know the last time you actually made yourself Thanksgiving Day full on soup, but this one will take you there. It is so yummy that I promise you will have too many helpings! Oh, and the garnish is ALMOST as important as the soup itself. Corn tortilla chips, obviously, make for a great crunchy texture combined with creamy chunks of avocado. Usually I top this bad boy with some sharp cheddar cheese, but I had a happy accident. All I had in the fridge was some goat feta cheese…and I think I will never go back to cheddar for this soup…it was crazy good! 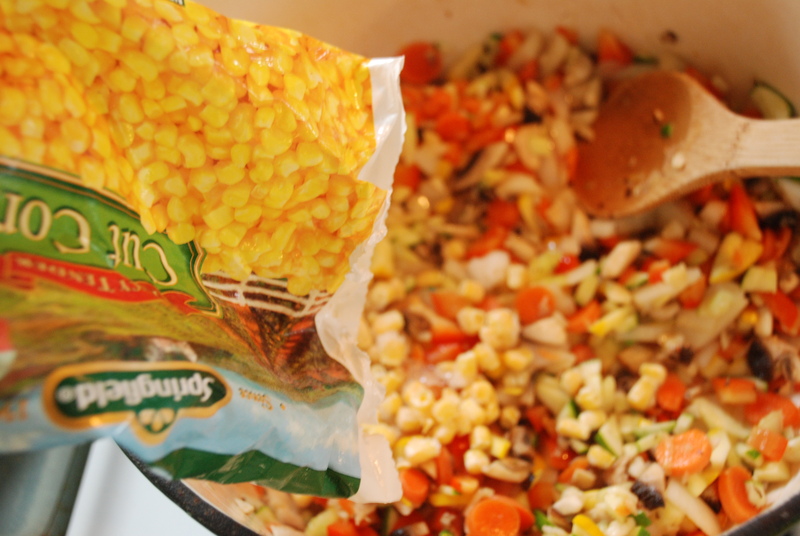 Combine all the vegetables and saute them until they soften a bit. 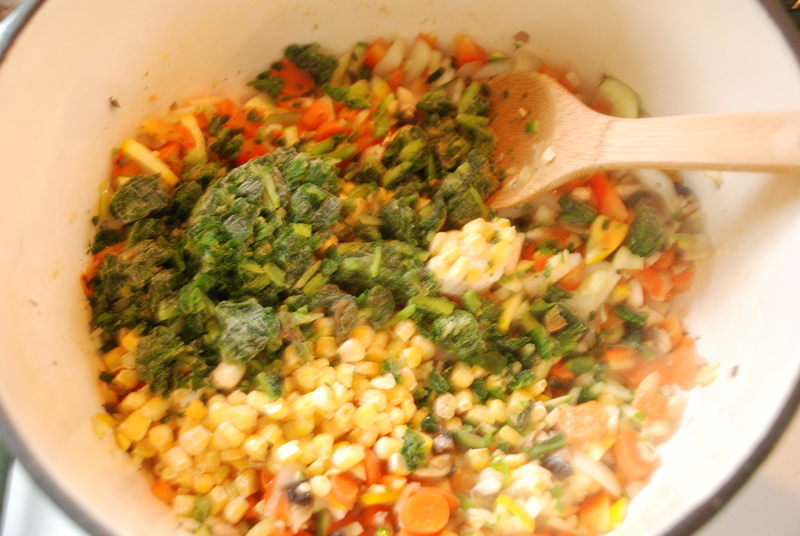 Add in the remaining ingredients, excluding the cilantro. Add water to cover the chicken, probably a couple of cups. Cook for 20 minutes and then remove the skin and bones. Mix in the cilantro and serve. Top with broken-up bits of tortilla chips, cubes of avocado and your cheese. Enjoy! Oh, and go ahead and give it a splash of hot sauce if you desire…I know that I like mine spicy.